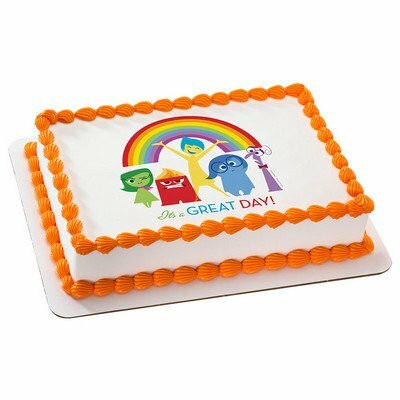 Create a Special Inside Out Birthday Cake for Your Child! Before the premiere of Disney’s Inside Out on June 19th, it took over three years for the Disney/Pixar hit film to come to the big screen. From it’s inception, the movie’s director, Pete Docter, wanted the film to depict emotions in a realistic way. He did a lot of research to make sure each emotion was depicted correctly. According to box office receipts to date, Disney’s Inside Out has earned over 185 million dollars as of June 30th, two weeks after it’s theatrical debut. The film is geared to every age level, and the fact that it addresses that growing up is hard and life is not always happy, sends a powerful message. It is okay to be sad, because if we are not, how can we truly know when we are experiencing happiness? And to top it all off, there is buzz that this film could be an upset winner at the 2016 Academy Awards in March. With themed birthday parties being popular with children of all ages, it naturally follows that a Disney Inside Out party would be the next big thing. There is so much that you can do with this colorful theme for both boys and girls, since the film features characters of each gender. IN fact, the character of Riley, whose mind is where viewers get a peek, is really not the star of the film. The true stars are the emotions of Joy, Disgust and Sadness (the female emotions) and ANger and Fear (the male emotions). Now your child can have her own birthday cake that ties in with this theme, complete with specialized edible toppers that we Baby Boomers never got to have! Over time, these cake decorations found themselves on top on any celebratory treat, very often for children's birthday parties. 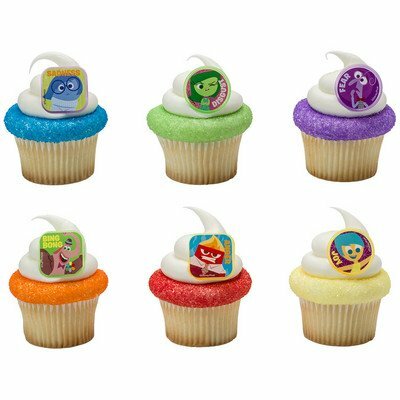 Unlike the bride and groom decoration, this Disney Inside Out play set is meant to be played with long after the last crumbs have been eaten off the birthday cake. This cake decoration set consists of twelve pieces. They can used for lots of imaginative play when the party is over and they are a part of a joyful memory for your child. Children today have more elaborate birthday cakes than we did in the past. A decorated cake was one that had a rosette or a balloon, and as the birthday child, you got that special slice of cake. Now there are customized themed toppers that can be used as a room decoration when the party is over. There are also toppers that feature favorite characters that lay right on top of the cake make it look like it was professionally done. Not only does this colorful Disney Inside Out cake topper turn an ordinary sheet cake into an edible masterpiece, it also has decorations that are zipper pulls. They can be used on coats and other articles of clothing once the entire sheet of sweetness is gone. If your child wants a simpler, cleaner look, then this topper is the one to buy. It is still very colorful and it has a rainbow in the center. Cupcakes are all the rage. From tiny bite-sized treats to supersized cake that holds a lot of flavored frosting, your party guests will be delighted to get one as a birthday treat. As an experienced parent of three, I prefer cupcakes to traditional sheet cake because they are so much easier to transport and serve at the party venue (if it is not at my home). No knives and serving spatulas needed! No arguing over who got the bigger piece of cake! There is little waste, and leftovers are easily shared with the neighbors. You can be creative with cupcake toppers and use them for your round or sheet cake. Every guest can take a piece of the film home with them! If you are planning on baking your own cake or cupcakes for the party? Perhaps you intend to have a cupcake decorating station and permit the girls to decorate their own desserts as one of the planned activities. Either way, there are plenty of other rainbow themed baking items that you can use to jazz up your birthday cake. Cupcake Rings Serve Double Duty! Not only do these cupcake rings make a fun and colorful decoration, they are also a party favor. Kids love to wear them once their confection is gone! Create a Simpled Themed Cupcake! If you want your party guests to have a blast, have them make their own themed cupcakes. This is simple to make and even young children can create one. Be sure to have a sample or two for the kids to see so they can get a visual to help them create their own. Themed Liners Are Also Available! 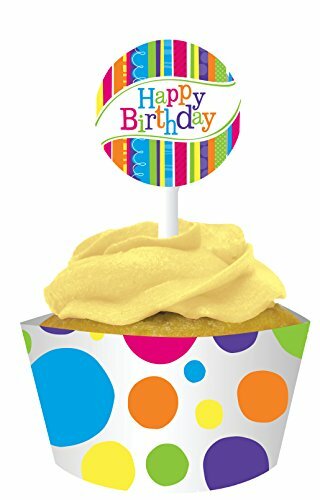 *FREE STANDARD SHIPPING - Cheerful Happy Birthday Polka Dots & Stripes Cupcake KIT - 12 Cupcake Wrappers & 12 Picks, Dusting Sugar Sampler, & Bonus Card - We Ship Within 1 Business Day! If you are not the cake decorating type, then these liners, which come with a "Happy Birthday" pick, will tie in nicely with your party. Another Version of an Edible Treat! You can create these rainbow colored cupcakes on your own. If you want, you can add mini M&M's or colorful sprinkles to make a one-of-a-kind treat that all guests are going to ooh and ahh over!